How about “When I saw Debbie, she had played golf”? Compare the past continuous and past perfect continuous. I think "When I saw Debbie, she had played golf" can also express "I saw her after the game". Am I right? Is there any difference in meaning? Does the perfect continuous imply that "I saw her right after the game"? When I saw Debbie, she had just played a round of golf. Same tense, but with the addition of "just" to indicate the temporal relationship. The phrase "a round of golf" adds the notion that this activity is telic, one having a defined end. "Playing golf" is not telic but atelic. When I saw Debbie, she had been taking guitar lessons for about a year. That sentence is slightly off, its door slightly ajar, its focus aspectually "blurry". The perfect opens the door to some kind of end or achievement and so it runs counter to the verb's a-telicity. It partners with such a context: had Debbie decided to quit the guitar? had Debbie been murdered? did she switch to the saxophone? did she join a band? Was she deciding whether to continue? Was she marking a milestone? Was there going to be a concert where students who had been taking lessons for a year would show their progress? Whatever. "When I saw Debbie, she had played golf." This implies that she has, at some point in her life, played golf. Not that she has recently finished as you seem to expect. I agree with Omegastick. 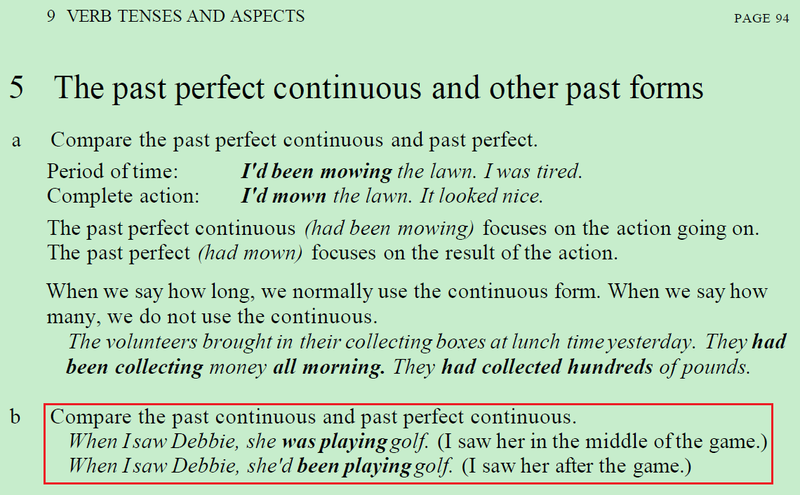 There is another example where you can use the past perfect. You would like to play golf with Debbie but when you saw her she had already played a game or a round of golf with someone else and she was tired. Like Tromano said this round of golf was completed before you saw her and the focus is on the completion, whereas she had been playing means she had just finished the activity and the focus is on the activity. It's a different situation. Not the answer you're looking for? Browse other questions tagged perfect-constructions perfect-aspect or ask your own question. When 'past modal+have+past participle' accompanies with past tense in a sentence, can it be before the past or at the past? Is it ok to say “would have had to have played” and “to have even had”? How has she gone to Prague? When to use “has/have had” in a sentence? what do you think about these 4 past perfects?